Political Equator 3 is a 2-day cross-border mobile conference that engages pressing regional socio-economic, urban and environmental conditions across the San Diego – Tijuana border. Following the format of previous Political Equator meetings, PE3 is a nomadic event, an itinerant conversation traversing the border landscape itself bringing participants to the actual sites of conflict. This time, the participants will oscillate between two marginal neighborhoods on both sides of the border known as creative urban laboratories for re-imagining the border region, San Ysidro in the US and Los Laureles Canyon in Mexico. PE3 will unfold through a series of performances and public walks that will traverse these conflicting territories enabling debates and conversations at different stations, including an unprecedented public border-crossing-performance through a large pipe under Home Land security that will allow the participants to cross the border from a protected Estuary on the US side into an informal settlement in Tijuana that collides with the border wall on the Mexican side. Attracting an international roster of artists, architects, environmentalists, scholars, community activists and politicians, PE3 will focus on The Neighborhood as a Site of Production, investigating practices in the arts, architecture, science and the humanities that work with peripheral neighborhoods worldwide where conditions of social and economic emergency are inspiring new ways of thinking and doing across institutions of urban development and public culture. While in the last years, the global city became the primary site of economic consumption and cultural display, local neighborhoods in the margins of such centers of economic power remained sites of cultural production. These are peripheral communities and neighborhoods where new economies are emerging and new social, cultural and environmental configurations are taking place as catalysts to produce alternative urban policies towards a more inclusive social sustainability. The main aspiration behind these meetings has been to shift the conversation from sites of abundance towards sites of scarcity, from which a new civic imagination can be produced. But fundamental to the rethinking of the economic logics of uneven urban development in the last years is the translation of the socio-cultural and economic entrepreneurial intelligence embedded in many marginal immigrant neighborhoods. The hidden value (Cultural, social and economic) of these communities’ informal transactions across bottom up cultural activism, economies and densities continues to be off the radar of conventional top down planning institutions. 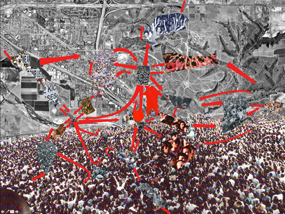 It is in the context of these conditions where a different role for art, architecture, environmental and community activist practices can emerge, that goes beyond the metaphorical representation of people, where only the community’s symbolic image is amplified instead of mobilizing its socio-economic entrepreneurship to produce new models of urban development. These communities’ invisible urban praxis needs artistic interpretation and political representation and this is the space of intervention that the PE3 seeks to discuss among participants. PE3 is co-organized by the Center for Urban Ecologies at the Visual Arts Department at UCSD, and two community-based, non-profit organizations on both sides of the border, Casa Familiar in San Ysidro, California and Alter Terra in Tijuana, Baja California, Mexico.